Vista drove me nuts – both because of its sluggishness, and because of a totally failed file and folder management strategy. At the height of my frustration I was experimenting with Total Commander, Opus 9 and a couple of other file management applications in an effort to rid my self of the the ‘built in’ windows explorer. 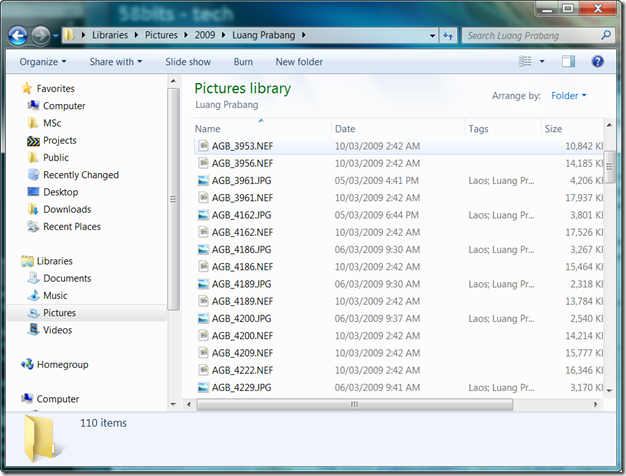 Folders did not remember the view or view preferences between sessions. Even worse was Vista’s attempt to guess the contents of a folder and ‘adapt’ accordingly. Maybe one day when we’re all in the cloud – or when the file system has been abstracted away by a content and keyword management system we won’t need conventional access to the file system per se – but we’re not there yet – and I do. Here’s what they’ve done in Windows 7 – which is exactly right. They’ve separated their attempt at managing views based on content – from a regular file management window (and all explorer windows always remember the last view used). So for example – if I’m looking at photos via the Picture Library – it looks like this. …with extra columns for tags and picture information. It’s a media specific view and that’s fine. Of course it could be a thumbnails view – but the important thing is that in details view – content specific columns appear. 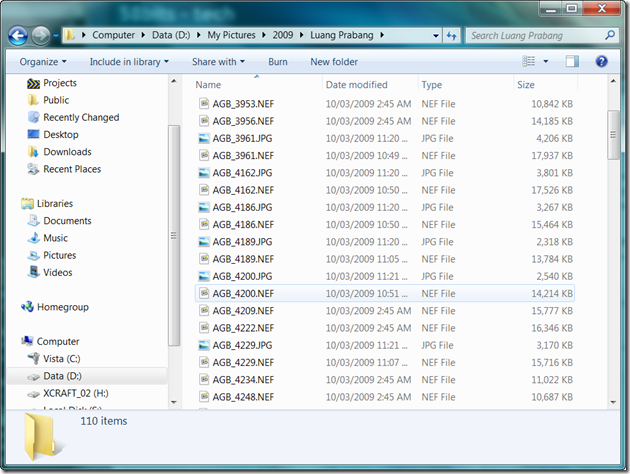 If I need a ‘real’ file system window though – say because I want to quickly sort by file type or some other file system criteria – then I navigate to the same folder via the file system using a ‘regular’ explorer window (Windows Key – E) – which looks like this. The default view for folders when you’ve entered them not via a Library but via the file system – is the ‘General Items’ view – which works like you’d expect it to when you need a ‘regular’ file management window. What a relief. It works. It makes sense, and I can use Windows Explorer again.